Jim Sweeney’s mother, Laura Sweeney, and aunt, Susan Schulze, are both breast cancer survivors. He wanted to do something in their honor, and also for others in need within his local community. “I wanted to get behind a cause. And my team wanted to do something bigger and better than what they’ve done before,” Sweeney said on getting himself and his A’s to back an event. Within the Signature Health Care network was Brockton Hospital. From Sweeney’s days in the real estate business, he had built a relationship with a client from the hospital that connected him with Jeff Miller, Signature Healthcare’s VP of Philanthropy. Miller loved the idea for a charity baseball game, and told Sweeney they’d be happy to lend his organization’s name to an event, as long as Sweeney would own it. And so he did. Brockton Hospital had an existing relationship with the Brockton Rox of the Futures Collegiate Baseball League. With Jeff Miller’s support, Sweeney secured Campanelli Stadium for the game. The catch? Sweeney was now personally on the hook to sell $2,000 worth of tickets for a forthcoming Rox game. In return, he’d to get to use Campanelli for KO Cancer. Sweeney obtain 500 tickets from the Rox and priced them at $10 each. He’d net $3,000 if he was able to sell all the tickets. Sweeney sold 92 tickets himself, and 100 more at gate on game day, Friday, August 3rd. With tickets taken care of, Sweeney and Strassmann went to work to secure sponsors, raffle items, and celebrities for the game. Securing sponsored innings proved to be harder than expected, but they sold 3 innings at about $500 per inning, plus about a dozen $100 sponsors. Each sponsor received a PA Announcement during the game and an insert in the Rox program. Players on the A’s and Brewers leveraged their own connections to obtain items for a raffle. Bob Thomas of the Brewers leveraged his role at Liberty Mutual to donate a signed Jim Rice wine decanter from the Corked Bat Collection. Joe Barros levered his position at LoJack to contribute a theft recovery package. Everything from restaurant gift certificates to Red Sox tickets to Karate lessons were donated. The Lowell Spinners even held a silent auction with signed sports memorabilia where all net proceeds were donated. Of course, no charity baseball game would be complete without a celebrity or two to incent the players to contribute, and to draw a gameday crowd. Oil Can Boyd was the starting pitcher for the Brockton A’s, tossing 3 innings, and allowing 3 runs. 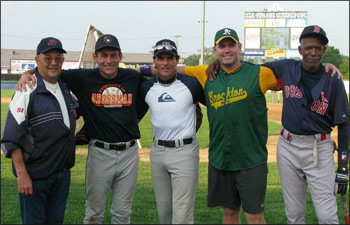 New England Patriot’s legend Doug Flutie plays a lot of amateur baseball. This season, he plays with the Reading Bulldogs in the Intercity league, plus the Natick Knights and Waltham Braves in the MSBL. Strassmann, who plays on several teams, is a teammate of Flutie’s on Waltham. 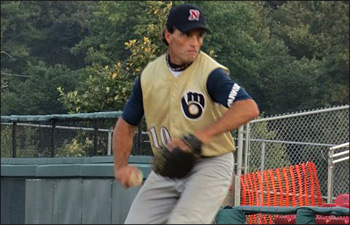 Doug Flutie was the starting pitcher for the Middlesex Brewers, recorded 3 shutout innings, and was the winning pitcher of record. I asked Sweeney how he decided who would get each celebrity pitcher on their roster. Sweeney commented on his state of mind during the game. Clearly, it was a tad more stressful as event organizer. Sweeney himself pitched the 4th, 5th and 6th innings for the Athletics. While 6-3 with a 2.52 ERA to that point in the season with Brockton, he allowed 7 runs in those 3 innings. Before the game, there were several niceties that Sweeney had coordinated. Former NBA journeyman and Boston Celtics player from 1995 through 2000, Dana Barros, was on hand to throw out the first pitch. Former Pawtucket Red Sox and Brockton Rox skipper, Ed Nottle, who compiled a 187-175 record with a 2003 championship during his tenure with the Rox, was on hand to lend support. Dave Joseph, also former batting practice coach for the Brockton Rox, tossed batting practice for both teams before the game –quite a treat for amateur players used to playing on city fields. Steve Joseph (Dave’s son), and current Brockton A’s pitcher, arranged a moment of silence prior to the game for Jeanne Price of Brockton who had lost her battle with cancer at age 36, almost a year before the game. Her entire family came down, including her two children, to support the effort. The Middlesex Brewers went on to defeat the Brockton A’s, 12-2, but the real final score has yet to be tallied. “We’re still having money come in. I wouldn’t be surprised if when all is said and done we raise as much as $10,000. Just a month after completion of this year’s inaugural game, plans are already underway for next year’s 2nd Annual KO Cancer game. Those wishing to make a donation may visit facebook.com/TheBrocktonAthletics, make a comment, and will be responded to promptly.